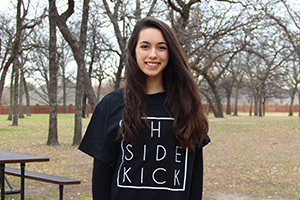 Rachel is a senior and has been on The Sidekick staff for three years; moving from graphic designer to Design Editor and now Editor-in-Chief. Academically, she is an International Baccalaureate diploma candidate. She spends much of her spare time working as a Graphic Design Intern for Marni G. Designs. For leisure she tends to spend the weekends rock climbing, watching movies or eating food with friends. She will be attending New York University in the fall.